Interview: open MRI scan versus "the tube"
“I went for an MRI scan through the NHS in Newcastle about six months ago. It was an abdominal scan for a health problem I’ve been having which hasn’t resolved after surgery. “I wasn’t nervous for the MRI and went alone to the clinic for my appointment. I was asked to change into a gown and to leave all my belongings in the changing room. I went into the scanning room with the radiologist, and he provided me with some headphones so I could listen to music. 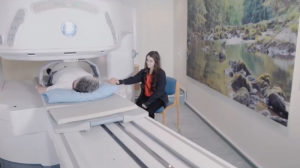 “He asked me to lay down with my feet in the opening of the scanner, and then he hit a button that moved me into the MRI scanner. “I was in the scanner for about an hour. My arms were stuck up, and very close to my body and they went numb after about ten seconds. I couldn’t relax due to the position and the noise. “So I was really disappointed when I found out, six months later, that I needed another MRI scan. After dealing with an uncomfortable, unhealed medical issue for a year, it wasn’t fixed, and the NHS told me that I wouldn’t get an appointment for about a month. It was at that point that I decided to go private because I couldn’t wait that long. “I had my paperwork sent to Newcastle Clinic and the next day they called to schedule an appointment in just five days’ time. They told me that I could bring someone with me, so my girlfriend came with me to the appointment. “As before, I changed into a gown and stowed all of my belongings in a locker – the radiologist, Jade, kept the key while I was having the scan. They also asked my girlfriend to leave her mobile and other metal objects in the locker. “I was shocked by how huge the open scanner was. I went in feet first again this time, but also got a support under my knees, a cushion under my feet and two pillows under my head. The radiologist hit a button to move me underneath the scanner and although my head was almost underneath the top, it wasn’t close to my face. “My girlfriend sat on a chair next to me and Jade told me that we could talk throughout the scan, and that I could move my head, arms and hands during the scan as long as I kept still from the waist down. She asked if we wanted to listen to music, which we did, and then she went into the other room to do the scan. 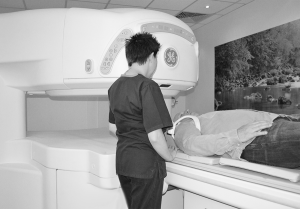 “The noise was nothing like the other MRI scanner – it was more like a hoover or a blender. Throughout the scan, the radiologist told me how long each scanning period would take and when she was starting a new scan. I didn’t feel impatient like I had in the closed scanner because it was segments of five or six seconds to get through at one time, and I just talked to my girlfriend the whole time. I could look at her instead of keeping my eyes closed or looking at the ceiling, and it was nice to be able to move my arms. “The staff were all friendly, the experience was way less annoying and the fact that I got an appointment and scan results within two weeks was incredible. Now my consultant is able to move forward with treating my health issues and I think I will be healed by the end of the year!